From time to time I am reminded of how little I know. Honestly, I am reminded on a daily basis. A few weeks ago someone asked me about the purple things hanging from the trees. Luckily, the person gave me some good southern directions on where I could find one of these things hanging around in Marianna. So I drove out to the site to get a better look. What I saw hanging in the tree was a three-sided, purple triangle about two feet tall and a foot wide. It looked to me like someone got a box kite stuck in a tree. 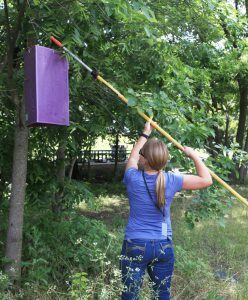 Upon further research, it was determined this box kite like thing was a monitoring trap for the emerald ash borer (EAB). The emerald ash borer (EAB) is a destructive, exotic wood-boring beetle native to Asia. It was first discovered in North America in July 2002 and has made a home in Michigan, Ohio and Ontario, Canada. 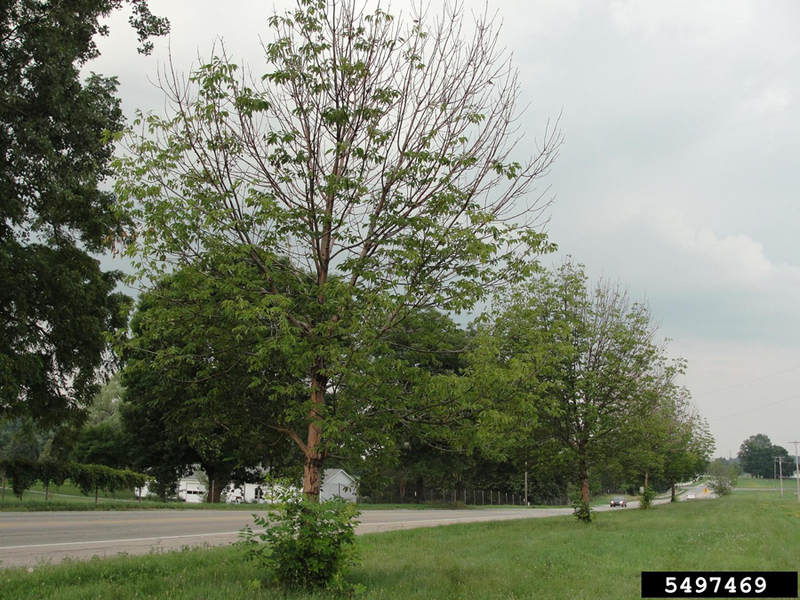 Millions of ash trees have been killed by the EAB in Michigan and invested ash tree nursery stock in other states indicates the potential for increased spread of the pest. EAB has made its way to the south and has been found in Louisiana and Arkansas. 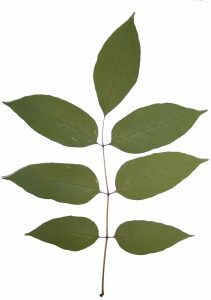 Ash Tree Identification – Ash trees are identified by their (1) opposite branching pattern, (2) compound leaves with 5-9 leaflets, and (3) diamond shaped bark ridges on mature trees. 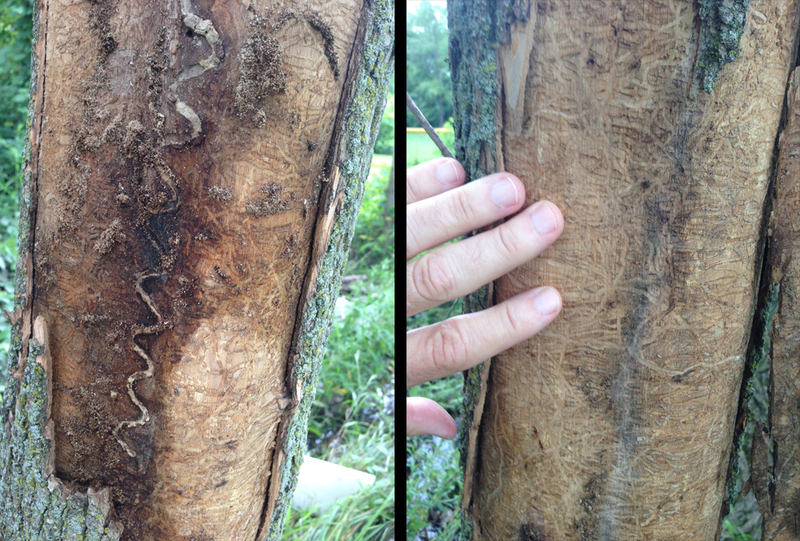 Woodpecker Damage – Of course, not all woodpecker damage on ash trees is associated with EAB infestation, but woodpecker damage in the upper part of the tree can indicate their presence. The woodpecker damage is usually accompanied by vertical cracks in the bark. Canopy Thinning – As the attack progresses, bark cracking continues and the canopy in the upper half of the tree begins to thin. 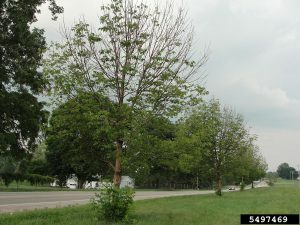 Tunnels and Holes – The emerald ash borer makes distinctive S-shaped tunnels that differ from damage from other borers. This beetle hitchhikes on firewood and infests new areas at an alarming rate. Although the EAB has not yet been detected in Florida, transporting firewood from other states puts Florida ash trees at risk. 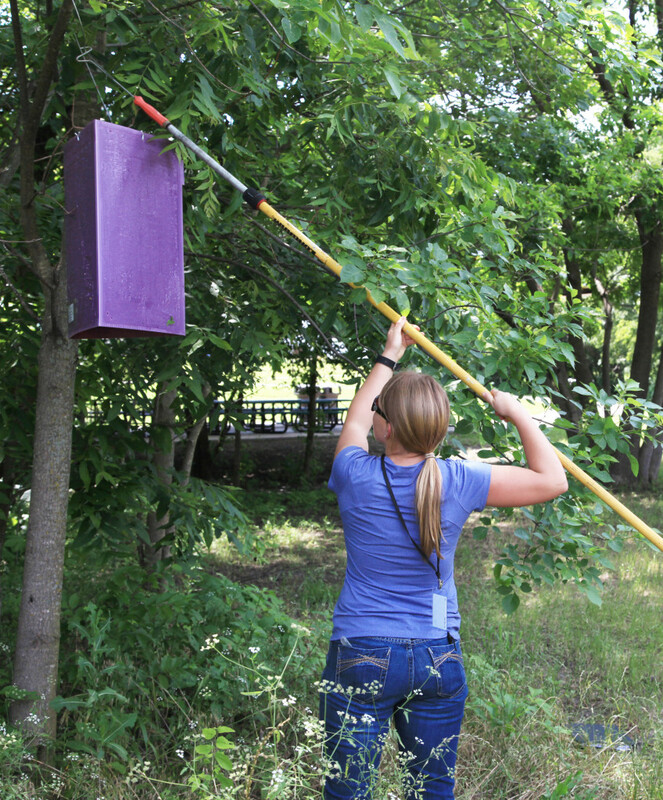 Your help is needed to detect possible infestations so they can be quickly eradicated. The information available at the following links will help you identify the EAB, EAB host trees, and infestation symptoms. Humans have used animal manures to fertilize food crops for thousands of years. Manures are an organic source of plant nutrients and are often a waste byproduct that must be properly managed when raising animals. Today, many farmers and backyard gardeners continue to use animal manures to provide nutrition to their crops. However, a recent experience at our local extension office brought to our attention the need to know what else, besides nutrients, is in the manure used. A local backyard gardener brought in samples of tomato plants that had strange new growth. She had purchased the tomato plants, along with other vegetable plants, from a local nursery. When she repotted the tomato plants into larger pots, she added horse manure from her own horses to the soil mix. She then noticed this strange growth on the tomatoes, but not in the other vegetable plants that were repotted without adding horse manure. 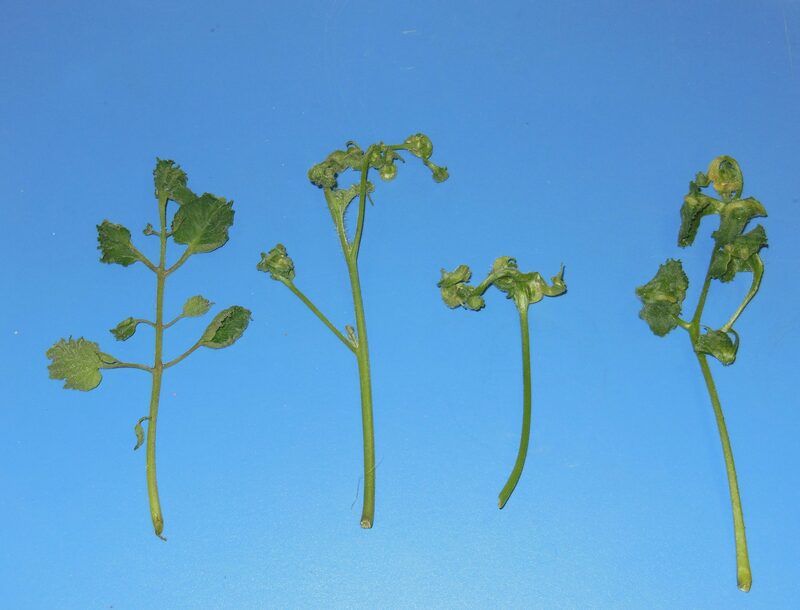 Herbicide damage was one of the first potential causes we suggested, since the new growth was twisted and distorted, a common symptom of plants that have been sprayed by herbicides. The gardener was sure she had not sprayed any herbicides near these plants, or in the pasture where she keeps her horses. 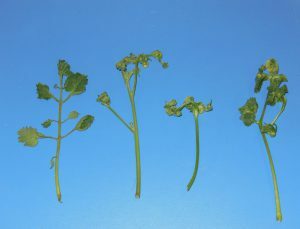 Photos of the tomato plants were shared with other NW District agents and an agriculture agent with livestock and hay producer experience had the probable answer – herbicide damage due to the horses being fed hay from a hayfield that was treated with a particular herbicide. Interestingly, this agent also had experience with these symptoms after their neighbor had similar issues using manure to fertilize the garden. Herbicides with the active ingredients picloram or aminopyralid are able to cause this kind of unexpected damage to many gardeners’ crops. Herbicides containing these active ingredients are used in hayfields to control broadleaf weeds. These herbicides are especially effective at controlling hard to manage weeds such as thistle, nightshade, and nettle. They also provide long-lasting weed control. 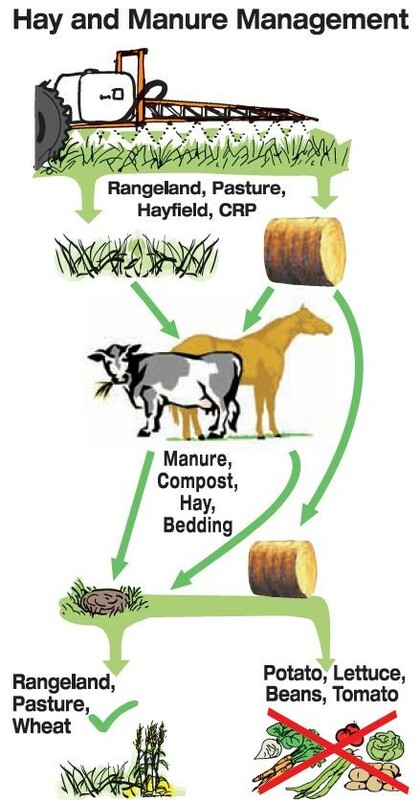 Unfortunately, the persistence of these ingredients extends into the hay, and also persists in the manure and urine of animals who eat hay from treated fields. These ingredients pass through the animal unchanged and remain active as an herbicide. Since many vegetable crops are broadleaf plants, the herbicide’s ingredients cause injury. So what can a farmer or backyard gardener do to prevent this problem? When purchasing hay for livestock, ask the seller if they know whether the hayfield has been treated with herbicides that contain either picloram or aminopyralid. Most herbicides are known by their common names, rather than their chemical name. If they give you a common name or brand name, the active ingredient can be obtained by contacting your local extension office. If the seller can’t tell you, then, as a precaution, do not use the manure to fertilize broadleaf vegetable crops. The same question should be asked if purchasing hay for mulch as well. 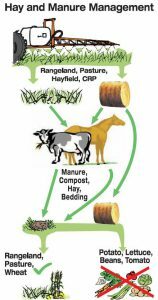 Composting the manure or hay does not break down the active ingredient, and may even concentrate it. While we continue to use animal manures to fertilize our crops as our ancestors did, it’s important to remember that many of the tools and products we use today are much more advanced. These advanced products require that we stay informed of all precautions, use them responsibly, and, in this case, inform end users of any precautions. Remember to always read and follow the label and ask questions. And if a science-based answer is what you’re looking for, your local extension office is a good place to go! Ponds can be a source of great enjoyment. However, properly managing them to meet your desired goals can be challenging. 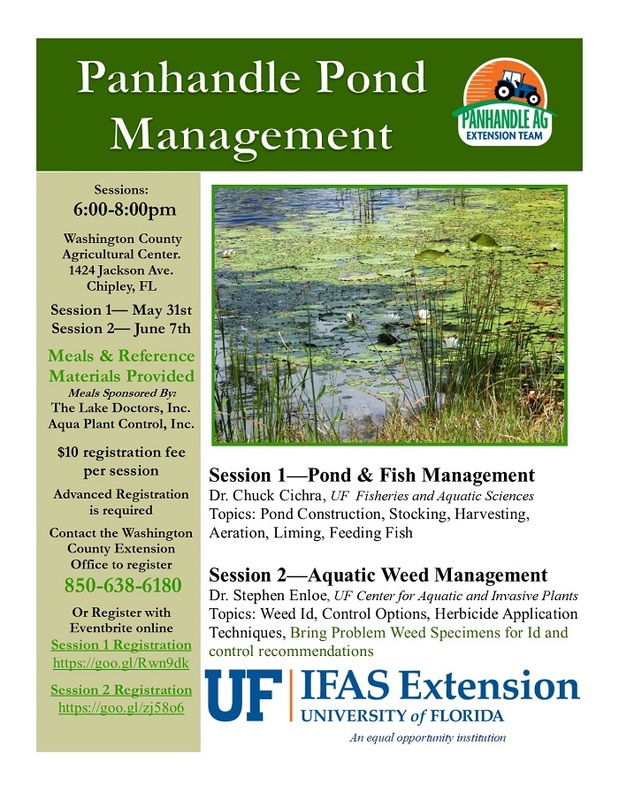 Panhandle Pond Management, a two part series being offered by UF/IFAS Extension, is designed to help pond owners/managers become more successful in reaching their goals. Specialists from campus will be onsite to share their expertise. Dr. Chuck Cichra, UF Fisheries and Aquatic Sciences, will lead session 1 and Dr. Stephen Enloe, UF Center for Aquatic and Invasive Plants, will lead session 2. 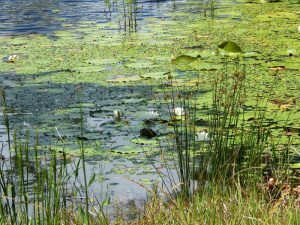 Session 1 – May 31st Fish Management will focus on decisions that the pond owner can make that directly relate to the success and productivity of the fish population in a pond. Stocking, harvesting, feeding, aeration and other topics will be covered. Session 2 – June 7th Aquatic Weed Management will involve weed identification, control options, and herbicide application techniques. If you have problem weeds bring samples for identification and control recommendations. 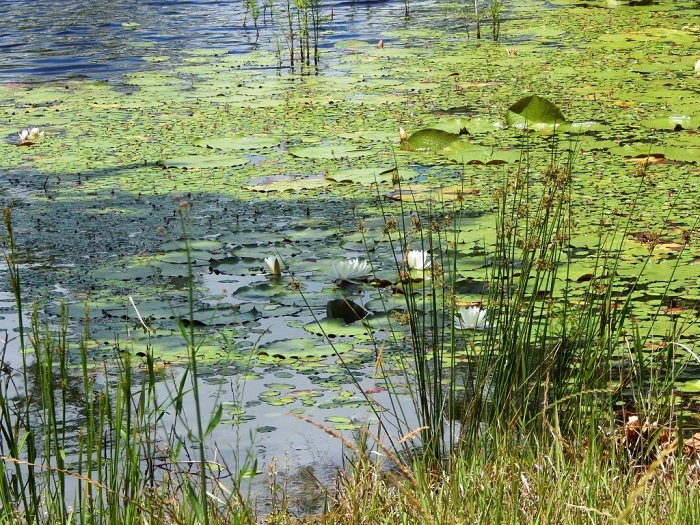 Panhandle Pond Management will be held at the Washington County Agricultural Center, 1424 Jackson Ave, Chipley FL. Each session will begin at 6:00pm; a meal will be served. To ensure we have enough food advanced registration is strongly encouraged. There is a $10 registration fee per session. To register call the Washington County Extension Office (850-638-6180) or use the links below for online registration. Session 2 attendees will receive a copy of Weed Control in Ponds a bound book sold through the IFAS bookstore. As cities expand, wooded lands and property with mature trees are being developed into commercial and residential sites. Unfortunately, the construction process can be deadly to nearby trees. In most cases, the trees don’t die immediately. Several years later as symptom development occurs in the declining trees, most people don’t associate it with the previous construction. However, it is possible to preserve trees on building sites if the right measures are taken. Trees and their root systems must be protected from damage during the construction process. Roots absorb the water and nutrients that are essential to tree health. Damage to the roots can lead to the death of a tree. Compaction of the soil from equipment operation can hinder the tree’s absorption of nutrients. The single most important action is to set up sturdy construction fences around the tree. The fence should be placed at least at the dripline of the tree’s canopy. As a general guideline, allow 1 foot from the trunk for each inch of the trunk diameter. Even with this method, 50% or more of the roots will be impacted by construction. No vehicles, building materials, waste, or soil should be allowed within the fenced area. No digging, trenching, or soil disturbance should be performed in that space. If construction equipment is allowed to operate close to the fencing, root pruning should be performed. A 4-5 inch deep trench should be dug on the outside of the tree protection zone with an air spade and then cut the roots cleanly with a saw. This root pruning technique will limit extensive damage to the roots. The next step that will help the survival of a protected tree is irrigation during the construction phase. Stressed trees need plenty of water throughout the process. This means watering each tree about 2-3 times per week to a soil depth of 4-6 inches. Additionally, an application of 3 inches of organic mulch within the tree protection zone would help maintain soil moisture. But, do not place mulch against tree trunks because it could cause fungus growth to the trunk. If roots are not pruned at the edge of the protection zone, mulch should be placed over any roots that could possibly be driven over to reduce compaction. Following construction the fencing can be removed, but irrigation needs to continue. However, the frequency should be reduced while the duration needs to be increased, to ensure that the tree receives enough water to maintain moisture in the top 12-18 inches of soil for the next year. Simply keeping a tree on site does not mean it will survive the construction process. If measures to protect the tree cannot be taken, the most practical approach is to remove the tree prior to construction. But, for some of the historical mature trees it is probably worth the effort to preserve some horticultural heritage of the area. Does Your Lawn Guy Need a License? 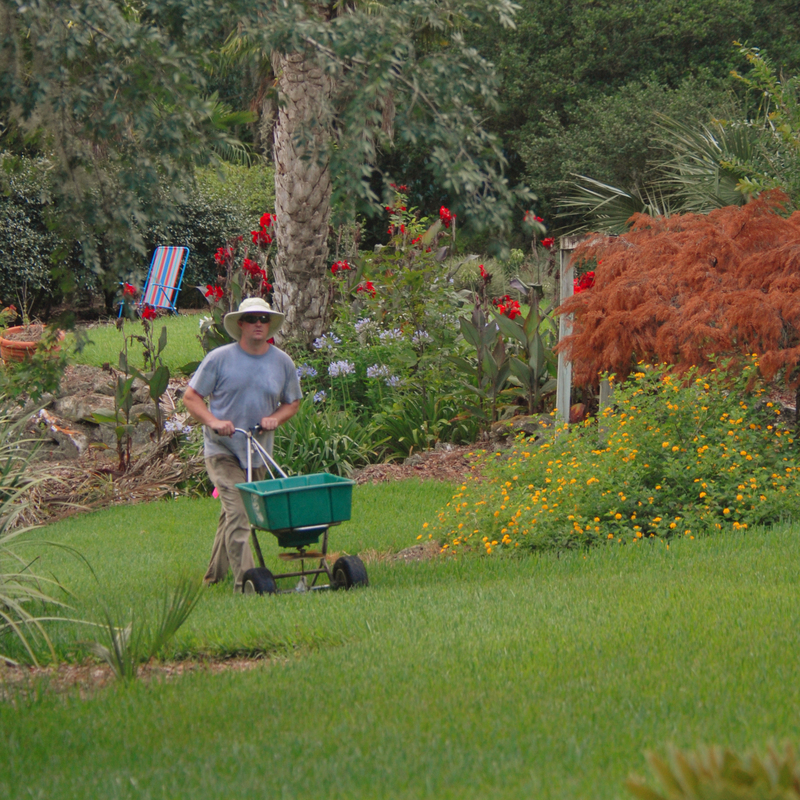 If your lawn and landscape care professional applies fertilizer as a part of his/her services, then the answer is yes. Since January 2014, the Florida Department of Agriculture and Consumer Services (FDACS) has required that all commercial fertilizer applicators have a Limited Fertilizer License. 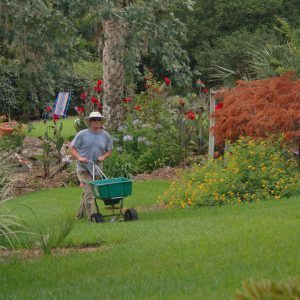 In order to obtain this license, lawn care professionals attend a science-based training session called Green Industries Best Management Practices (GI-BMPs) that teach environmentally friendly landscaping practices in order to protect Florida’s water quality. These practices also save the homeowner money, time, and effort; increase the health and beauty of the home landscape; and protect the health of your family, pets, and the environment. The training is led by UF/IFAS Extension professionals. Attendees must pass a post-training exam and then can receive a license valid for 4 years. In order to check whether your lawn care professional has a Limited Fertilizer License, check the FDACS site here. Every applicator must have his/her individual license.